and interpreting the articles individuals to gain full understanding and impact. board members, and current and potential JTATE authors. Baumgartner, E. & Ferdig, R.E. (2018). Editorial: What We Learned About Technology and Teacher Education in 2018. Journal of Technology and Teacher Education, 26 (4), 509-517. Waynesville, NC USA: Society for Information Technology & Teacher Education. Retrieved April 19, 2019 from https://www.learntechlib.org/primary/p/207493/. Baecher, L., Kung, S.-C., Ward, S.L., & Kern, K. (2018). Facilitating Video Analysis for Teacher Development: A Systematic Review of the Research. Journal of Technology and Teacher Education, 26(2), 185-216. Bannister, N., Kalinec-Craig, C., Bowen, D., & Crespo, S. (2018). Learning to Notice and Name Students’ Mathematical Strengths: A Digital Experience. Journal of Technology and Teacher Education, 26(1), 13-31. Buchbinder, O. (2018). Supporting Prospective Secondary Mathematics Teachers in Producing Instructional Explanations Through a Video-Based Experience. Journal of Technology and Teacher Education, 26(1), 33-56. Chazan, D., Herbst, P., Fleming, E., & Grosser-Clarkson, D. (2018). Technological Supports for Practice-Based Teacher Education. Journal of Technology and Teacher Education, 26(1), 5-11. Chizhik, E.W., & Chizhik, A.W. (2018). Value of Annotated Video-Recorded Lessons as Feedback to Teacher-Candidates. Journal of Technology and Teacher Education, 26(4), 527-552. Driver, M.K., Zimmer, K.E., & Murphy, K.M. (2018). Using Mixed Reality Simulations to Prepare Preservice Special Educators for Collaboration in Inclusive Settings. Journal of Technology and Teacher Education, 26(1), 55-77. Ferdig, R.E. & Chenowith, N.H. (2017). Editorial: Submissions and publication data from the 2016 volume of the Journal of Technology and Teacher Education. Journal of Technology and Teacher Education, 25(2), 125-129. González, G., & Dejarnette, A.F. (2018). Designing Animated Stories of Instruction for Teacher Education: The Process of Making an Animation to 516 Promote Teacher Noticing of Students’ Prior Knowledge. Journal of Technology and Teacher Education, 26(1), 79-102. Gretter, S. (2018). Can We Support Preservice Teachers’ Intention to Teach Media& Information Literacy? Reflective Exercises with the Theory of Planned Behavior. Journal of Technology and Teacher Education, 26(4), 553-586. Hestness, E., Ketelhut, D.J., McGinnis, J.R., & Plane, J. (2018). Professional Knowledge Building within an Elementary Teacher Professional Development Experience on Computational Thinking in Science Education. 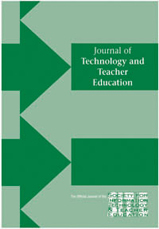 Journal of Technology and Teacher Education, 26(3), 411-435. Hollebrands, K., Mojica, G., & Outlaw, B. (2018). Teachers’ Analysis of Student Thinking in a Teaching Mathematics with Technology Massive Open Online Course for Educators. Journal of Technology and Teacher Education, 26(4), 587-612. Hougan, E., Johnson, H., Novak, D., Foote, C., & Palmeri, A. (2018). Exploring the Influence of Accomplished Teachers’ Video and Commentary Pairing on Teacher Candidates’ Noticing and Thinking about Practice. Journal of Technology and Teacher Education, 26(2), 217-248. Israel, M., Ray, M.J., Maa, W.C., Jeong, G., Lee, C., Lash, T., & Do, V. (2018). School-embedded and district-wide instructional coaching in K-8 computer science: Implications for including students with disabilities. Journal of Technology and Teacher Education, 26(3), 471-501. Kucek, S. (2018). How Pre-service Teachers Learn Educational Technology with the Situated Learning Approach. Journal of Technology and Teacher Education, 26(2), 249-274. Lok, L., Schellings, G., Brouwer, N., & Den Brok, P. (2018). Investigating effects of using digital video in teacher training in Cambodia. Journal of Technology and Teacher Education, 26(2), 275-298. Milewski, A., Herbst, P., Bardelli, E., & Hetrick, C. (2018). The Role of Simulations for Supporting Professional Growth: Teachers’ Engagement in Virtual Professional Experimentation. Journal of Technology and Teacher Education, 26(1), 103-126. Mouza, C., Yadav, A., & Ottenbreit-Leftwich, A. (2018). Editorial: Developing Computationally Literate Teachers: Current Perspectives and Future Directions for Teacher Preparation in Computing Education. Jornal of Technology and Teacher Education, 26(3), 333-352. Ozogul, G., Karlin, M., & Ottenbreit-Leftwich, A. (2018). Preservice Teacher Computer Science Preparation: A Case Study of an Undergraduate Computer Education Licensure Program. Journal of Technology and Teacher Education, 26(3), 375-409. Rich, P., Belikov, O., Yoshikawa, E., & Perkins, M. (2018). Enablers and Inhibitors to Integrating Computing and Engineering Lessons in Elementary Education. Journal of Technology and Teacher Education, 26(3), 437-469. Walkoe, J., & Levin, D.M. (2018). Using Technology in Representing Practice to Support Preservice Teachers’ Quality Questioning: The Roles of Noticing in Improving Practice. Journal of Technology and Teacher Education, 26(1), 127-147. Weston, T.L., Kosko, K.W., Amador, J.M., & Estapa, A.T. (2018). Preservice Teachers’ Questioning: Comparing Platforms for Practice-Based Teacher Education. Journal of Technology and Teacher Education, 26(1), 149-172. Woodward, L., & Hutchison, A. (2018). The STAK Model: Exploring Individualized Professional Development for Technology Integration in Literacy. Journal of Technology and Teacher Education, 26(4), 613-644. Chang, Y., & Peterson, L. (2018). Pre-service Teachers’ Perceptions of Computational Thinking. Journal of Technology and Teacher Education, 26(3), 353-374.